Recently we have been reviewing Dragons at Crumbling Castle by the ever so witty, late Terry Pratchett. This is an amazingly entertaining and imaginative Children’s story book. From Polite Dragons dwelling at Crumbling Castle, little people that live on dust particles, a tiny community dwelling amongst the carpet piles, Hercules the Tortoise explorer, Father Christmas paying a visit to the job centre and ending up landing a job at the zoo, and many more wonderfully bizarre tales. To be totally honest I have never read any of Terry Pratchetts books before so I was curious as to what his style was like. 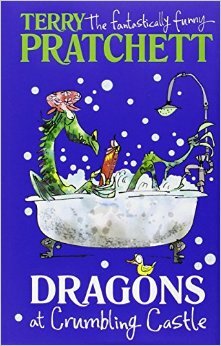 I read these stories to my 5 year old as part of our bedtime routine and he absolutely loved them, his favourite being the Dragons. I too enjoyed reading this to Monkey, it has some lovely comical illustrations through out and the stories are very captivating, filled with fantasy that little ones love to thrive on. An Inspirational Author who left a lasting impression within his books. This gets a big thumbs up from us and I would certainly recommend getting a copy if you haven’t already over on Amazon.